I’m back from a hiatus and ready to cook! For the last two weeks, no one has allowed me to lift a finger in the kitchen. The closest I came was standing next to a grill while my father tended to potatoes and a delicious pork tenderloin. Yum! But being a bystander isn’t my thing. At least not in the kitchen. We picked up the farm share tonight, and boy have things on the farm changed in the last few weeks! Gone is the lettuce and abundance of leafy greens. Hello corn! Welcome garlic! Greetings green beans! And yellow beans. And purple beans. I wasn’t home 5 minutes before I had the zucchini and summer squash chopped and in a bowl. I tossed them with olive oil, a dash of lemon juice, fresh parsley, salt and pepper. While that was grilling (thanks to my handy sous chef), I made some couscous. Just regular old couscous, boiling water and a small pat of butter. Nothing fancy. Tossed it with the veggies, added a touch more olive oil and some feta cheese. Voila! A delicious one-dish dinner in about 15 minutes. 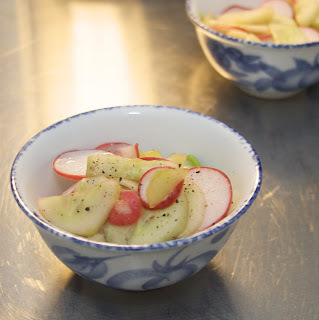 A few notes on variations of this dish: 1. Great served warm, at room temperature or chilled on a sultry summer evening; 2. Adding toasted pine nuts would certainly add some complexity; 3. The grilled squashes alone would be a delightful side dish. As promised, I did make a lot of salads this week. Mostly leafy green, but some variation. I’ve put pictures and commentary of the highlights below. As always, I view recipes as a guide and never fear to deviate from the proportions, ingredients, technique, cutting shapes, lengths, styles or cooking methods. I encourage the same of cooks everywhere! combination made sense to me. We just happened to have 4 fava beans that I didn’t know what to do with, so they made it into the salad as well. Not so simple as it sounds because they were only tossed in after being de-podded, blanched and peeled. For a few little legumes, it was a fair amount of work, but they were a welcome addition to the salad in several dimensions: color, texture and taste. The one major change I would recommend to the recipe is to chill the salad thoroughly before serving. I didn’t do that, and harkening back to childhood reminded me that this dish could have been much more refreshing. intended dietary change, though one that makes sense when such an influx of veggies invades one’s home (yes, I admit that I am still struggling with a lack of control). I defrosted some chicken thighs from the freezer, sauteed them in canola oil and added chipotle sauce (more on that later, I promise), which was the key here. 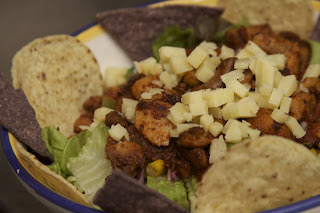 Roasted corn, cheddar cheese and salsa on a bed of crunchy lettuce, some blue and white corn chips around the dish for display and satisfying crunch. Voila! No dressing needed, and this packed a flavor punch! The last couple weeks have been busy and uninspiring, to say the least. I made some collard green chips, quesadillas and focaccia. Nothing was a disaster, but there were no rousing successes either. I do want to share some pictures of the products we’ve been getting. The first is of garlic scapes, and the others below are some of the beautiful greens we’ve gotten. After a weekend of camping, which is not conducive to cooking farm share goodies, I came home this afternoon to find that we have an overabundance of lettuce. In addition to what we got from the share, I also grow several kinds of lettuce. With all the rain we’ve been getting, it was screaming to be picked. Given this and knowing that there is much more coming our way on Tuesday, I decided that it’s time to get down to business: It’s salad time! Tonight I followed a recipe from Cooking Light. I usually modify recipes, but we stuck pretty closely to this one. The only major change I made was to substitute bacon for prosciutto, which we don’t generally keep on hand. The arugula was all from my garden. 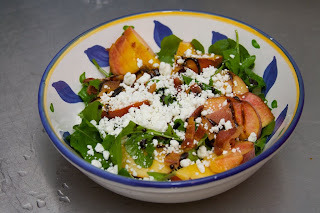 Overall, it was a nice mix of the nutty, bitter arugula, the sweetness of the balsamic & honey drizzle, smoky sweet peaches and saltiness of the bacon. A lot for for the palette and brain to process. After dinner I washed and packed up several heads of lettuce so be prepared for lots of salad recipes in my next post. Don’t throw a few sugar snap peas into your purse or backpack to snack on because throughout the course of the day as you take other things out, the sugar snaps will latch on and soon you will have them on the floor of your office, up your sleeve, on your desk…who knew they could be so messy? -Collard Green sandwich with garlic scape cream cheese (a dip that was a hit with coworkers too), roasted red peppers and melted provolone. Side of sauteed simple swiss chard. -Lots of green salad. Lots. With the farm share we’re participating in, we get some choice in what we bring home, and there’s an added bonus of ‘pick-your-own’ products each week. So I’ve changed my tune and am embracing the farm share as a challenge. It’s a challenge not only to relinquish some control over what food is coming into my kitchen, but an attempt to make it interesting and unusual as well. Moreover, I am trying to embody the philosophy of the farm providing the produce: Take what you will use. So minimizing waste is also part of my agenda. I used to choose a country to focus on each week or make decisions based on what was on sale at the grocery store. No longer. Today the farm sent an email with an estimate of what will be in this week’s share. It’s very similar to last week – leafy greens, leafy greens and more, yes, you guessed it – leafy greens. I guess it’s time to face my fears of repetitive produce. More greens? Didn’t I eat enough for a lifetime last week? Won’t I get too much Vitamin B12 and iron? Mother Nature disagrees. It’s time for big leafy springtime greens. And so the challenge begins. First on the agenda: Collard Green Chips. Can’t wait! We got our first farm share distribution today, and boy do we have a lot of leafy greens! There are a couple items I’ve never worked with before, so my first challenge was to identify them and investigate recipe options. Garlic scape turns out to simply be the greens of a garlic bulb, which is less spicy and pungent than the garlic head. Another new-to-me item is tatsoi, which is an asian green. We’ll see what I end up doing with these throughout the week. Other items in the share are spinach, lettuce, swiss chard, kale, collard greens, a few sugar snaps.